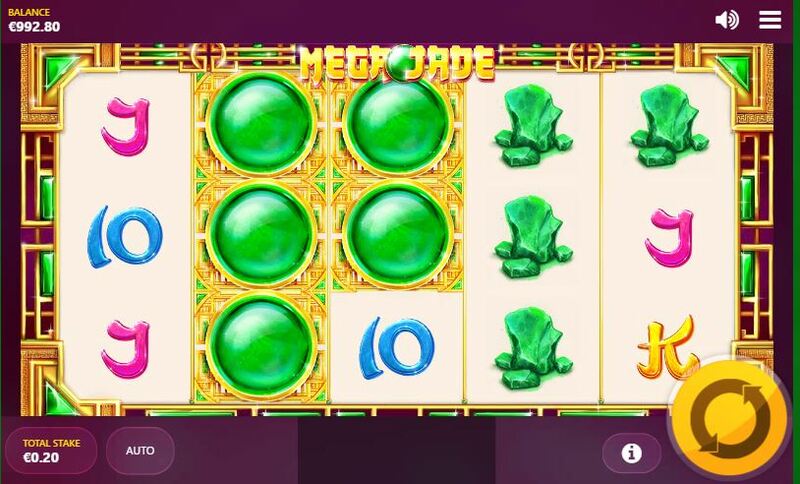 Mega Jade slot belongs in Red Tiger's Oriental collection along with Jade Charms which also pays tribute to this revered green precious stone so treasured in China for its beauty and value. The plain reels sit comfortably on a gilded background embedded with Jade while we are treated to the sound of gentle Chinese music as the reels spin and land. So we've seen plenty of Jade but will the 'Mega' aspect of the title also apply to this game? 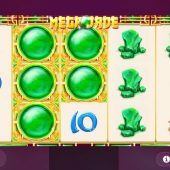 'Mega' certainly can apply as we will shortly find out, but let's begin with the reels which are the standard 5 with 3 rows each and like Red Tiger's Wild Spartans slot there is some volatility as we only get 10 pay lines but this time with a difference: all lines pay adjacent, which means that 3 consecutive symbols pay anywhere on the line, i.e. last 3 reels or middle 3 reels as well as the usual left-to-right. There are stacked symbols on all reels but we don't get any Wilds here at all, nor any random in-play features which is unusual for Red Tiger games! The Jade circle in the Gold setting is the top award at 25x bet for a 5-of-a-kind win, followed by the Jade hexagon at 15x, Jade square at 12.5x and the raw unpolished Jade at 10x bet for the 5. There are the card values making up the remainder at 5 to 7.5x bet for the 5 and that's all you get - no scatters either! Each spin there will be a 3x3 Giant Symbol of the top-paying Jade Circle set in gold. This can cover any adjacent 3 reels and if landing fully pays at least 25x bet if no others fall on the reel(s) next to it. That's your lot.